Wayne shares recipes and tips to make a Halloween party fun for both adults and kids. The kid in all of us still gets a big kick out of Halloween. Plus, those of you who now have children of your own know that having a party that everyone can enjoy makes Halloween truly a family affair. Here are a number of simple ideas that will make a Halloween party a big success for adults and kids. To add a little gross out factor to a simple lemonade punch, I added a few drops of green food coloring, tossed in two halves of a pomegranate and then made ice filled with some interesting ingredients. First, I cut a small apple in half cored it. I also poked a hole all the way through that was large enough for a gummy worm. Then, I inserted the worm and froze both for a few hours. I then put the apple and worm in a small bowl and covered them with water and froze everything again. I did the same with candy fish by putting them in small shot glasses filled with water and freezing. I then remove both from the freezer and place them in warm water briefly to remove them from their containers and added them to my punch. I also tossed in a few additional worms and fish just to make it more colorful. 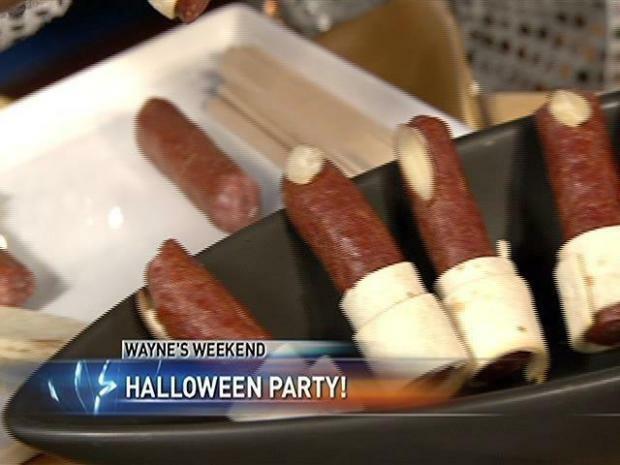 Wayne gives ideas to make your party a spooky-affair. Take a small seedless watermelon and slice a small amount off the bottom so that it rests flatly on a surface. Using a potato peeler, remove just the green surface of the melon. Then using a knife, carve patterns in the melon resembling a brain, cutting deep enough to reveal the red portion of the melon (it’s best to start by creating a center channel down the length of the melon much like a real brain. When completed, use the brain as a centerpiece or get a second melon and cut out melon balls and place them around the base of the first and add toothpicks. By using navel oranges as “pumpkins” you can fill them with a gelatin mixture for tasty single servings. Slice the top off the oranges much like a pumpkin. Using a spoon, carefully dig inside the orange along the inside wall to separate the meat of the orange from the peel. Be careful not to cut through the orange. Remove all of the insides (as much as possible) and place in a blender. Blend until smooth and then strain out the liquid. Place the orange shells and tops in the refrigerator. Pour the strained juice into a measuring cup. Add water, if necessary, until you have 1 1/2 cups of liquid. Pour half of the liquid into a small pan and bring it to a boil. Mix in gelatin mixture and remove from heat. Pour into a bowl and add remaining liquid. Refrigerate for 1 hour. Add strawberries to the mixture and then pour it into the 4 orange shells. Refrigerate until mixture if fully set and firm (3-4 hours). Remove oranges from the refrigerator and, with a sharp knife, cut faces in the oranges much like pumpkins. Place tops on oranges and serve. For a nicer and functional presentation, you can also insert spoons into the tops of the oranges so that the stem of the spoon pokes out like a pumpkin stem and the spoon itself is inserted into the strawberry mixture when the top is set in place. Prepare cupcakes and frost them with your favorite icing. Pour sprinkles into bowl and roll freshly frosted cupcakes into them to coat. Set aside. Separate cookies from the filling. Place filling in a small bowl and add1 teaspoon of milk and mix thoroughly. Put into a sealable disposable plastic bag and set aside. With the 30 cookie halves, do the following: Cut 24 cookie halves in half to form half moons. Set aside. With the remaining 6 halves, cut each in half and then cut each half into 4 pie shaped wedges, yielding 48 total little wedges (these will be the bats’ ears). To assemble the cupcakes, insert two half moon shapes into the top of each cupcake, just below center and near the outer edge, forming wings. Take two little pie wedges and insert them in top of the cupcake with the pointed side out. Place two Red Hot Candies below the wedges for the eyes. Finally, cut off one of the corners of the disposable bag and use it to squeeze out the filling onto the cupcake, forming a nose, two fangs and a mouth. 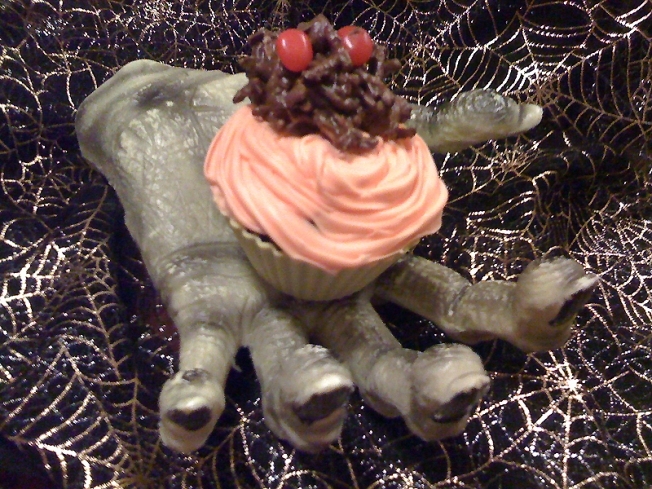 These are simply cupcakes of your choice with orange frosting on top and then a small version of Patti Bogdanovich Arnish‘s spider cookies that I recently shared with you. Make the mounds about the size of a walnut. Once cooled, place on top of each cupcake, a little off center. Unroll the pasty sheet and shape it into 8” x 12” rectangle. Cut in into thirds, crosswise, yielding three 4” x 8” pieces. Cover and refrigerate two of the pieces while working with the first one. Cut the first piece into twelve 4” long strips. With each strip, cut a 1” slit on both ends. Roll each of the slits into a little ball and press the two on each end together to simulate then end of a bone. Repeat with the remaining pieces and the remaining other two pieces of dough, yielding 36 total bones. Melt the butter and brush each of the bones. Mix together salt and cheese and sprinkle over bones. Bake for 6-8 minutes or until golden brown. Remove from oven and allow to cool. Store in airtight container. Cut the bananas in half widthwise. Insert a popsicle stick into the bottom of each and place them in the freezer for 2 hours. Place the white chocolate into double boiler to melt (you can also use a microwave). Once melted, add frosting and continue to heat until mixture is the consistency of thick syrup. Pour mixture into a tall container (like the frosting can). Dip the frozen bananas into the mixture and let them drain a bit*. Place on wax paper and insert chocolate morsels as two eyes and a mouth. Return to freezer until ready to serve. *you may need to reheat the mixture if it starts to thicken too much. 2-3 flour tortillas, 8” size, cut into 1” wide strips. Soften the tortilla strips by microwaving them for about 12 seconds. Lightly spray them with cooking spray and then wrap each around one end of the salami stick. Secure the tortilla with a toothpick. Place all the fingers on a baking sheet and bake for 8-10 minutes or until tortillas are just beginning to brown. Remove and cool completely. Once cool, put a dab of cream cheese on an almond sliver and press it on the front tip of each salami stick, opposite the tortilla wrapped side. For an even more graphic presentation, dab a bit of ketchup on the tortilla strips to resemble blood. As a simple alternative to an ice chest, hollow out a wide pumpkin and let it dry out. Fill it with ice and your favorite bottles beverages or juice boxes. In addition to making your own fun treats for your Halloween party, there are number of fun new products that will provide a little more silliness and ghoulishness to your event. Some may be hard to find, so I’ve included sources in parenthesis. If you decide to make little take home bags for everyone, these make great bag stuffers.